Surface mount technology equipment facilitates widespread solution for different end use industry which include automotive, aerospace and defense, consumer electronics, healthcare and industrial among others one of the major factor encouraging the demand and high speed installation of surface mount technology equipment market is its operational effectiveness owing to cost effective processing. Growing usage of flex circuit in wearable electronics across various sector especially in smart phone and smart card industry is the primary factor predicted to foster the demand and innovation of surface mount technology market during the forecast period from 2018 to 2026. By equipment type, the surface mount technology equipment market is segmented into placement equipment, inspection equipment, soldering equipment and cleaning equipment among others. Placement equipment held the largest market share in terms of revenue, followed by soldering equipment. The growing demand for printed circuit board in smartphones in order to fulfill the demand of smartphones is having a positive impact on the market for surface mount technology equipment market. Changes or modification made in the design of printed circuit board files will results in increasing in development cost and would lead to delay in production time. Hence, to address these issues, manufacturers are focusing on reducing these costs during the production process. This in turn has increased the installation of PCB SMT equipment. In addition, inspection equipment is bifurcated into AOI, AXI, and SPI. AXI device type, is expected to grow during the forecast period owing to increasing requirement to inspect double-sided solder joints and non-visible solder joints with exact traceability. By end use industry, the global surface mount technology equipment market is segmented into automotive, aerospace and defense, consumer electronics, healthcare and industrial among others. Consumer electronics held the largest market share in terms of revenue in 2017, followed by industrial segment and is expected to remain the leading end use industry during the forecast period. Placement and soldering equipment technology is used in different consumer electronics manufacturing industry which in turn has increased application scope of the surface mount technology equipment market. Moreover, surface mount technology embedded cleaning equipment can be operated semi- automatically and manually. In addition, with the introduction of industrial devices and smart electronic devices, the market for SMT cleaning equipment is expected to increase due to growing adoption of cleaning equipment in their production line. Healthcare is the foremost sector in triggering the growth prospect of surface mount technology equipment market globally. Penetration of electronics and automated products in healthcare industry drive the opportunity for surface mount technology equipment market in this segment. Additionally, minimum operating and maintenance cost and ease of operation are the primary factors behind this segment’s huge demand. On the flip side, increase in high investment cost of machinery is expected to negatively influence the growth of global SMT equipment market. By geography, the surface mount technology market is segmented into North America, Europe, Asia Pacific (APAC), Middle East & Africa (MEA) and Latin America. In 2017, Asia Pacific dominated the market share in terms of revenue in 2017 and is anticipated to maintain its leading position during the forecast period from 2018 - 2026, followed by North America. With the increasing technological advancement, the application of printed circuit board in consumer electronics sector such as smart phones, tablet, and computer, Liquid Cristal Display (LCD) and -Light Emitting Diode (LED) among others is rapidly increasing across different industry verticals in Asia Pacific. China, Japan and South Korea is leading the market for printed electronics circuit board, followed by Thailand, Indonesia and India across Asia Pacific. Some of the major players operating in the surface mount technology equipment market are Mycronic AB, Nordson Corporation, Viscom AG, Fuji Machine Mfg. Co., Ltd., ASML Holding, N.V., KLA-Tencor Corporation, Juki Corporation, Panasonic Corporation, Hitachi, Ltd., Orbotech Ltd, JUTZE Intelligence Technology Co., Ltd., Koh Young Technology, Mirtech, Omron Corporation, PARMI Corp., Test Research, Inc., and Yamaha Motor Co., Ltd. among others. The Surface Mount Technology Equipment market report provides analysis for the period 2016–2026, wherein the period from 2018 to 2026 is the forecast period and 2017 is the base year. The report covers all the major trends and drivers playing a key role in surface mount technology equipment market growth over the forecast period. It also highlights the drivers, restraints, and opportunities expected to influence market’s growth during the said period. The study provides a holistic perspective on the surface mount technology equipment market’s growth throughout the above mentioned forecast period in terms of revenue (in US$ Mn) and Volume (Thousand Units), across different geographies, including Asia Pacific, South America, North America, Europe, and Middle East & Africa (MEA). The market overview section of the report demonstrates the market dynamics and trends, such as the drivers, restraints, and opportunities that influence the current nature and future status of this market. An attractiveness analysis has also been provided for every region in the report, in order to give a thorough analysis of the overall competitive scenario of the surface mount technology equipment market, globally. Moreover, the report provides an overview of the various strategies of key players present in the market. Based on equipment type, the surface mount technology equipment (SMT) market is segmented into placement equipment, inspection equipment, soldering equipment and cleaning equipment among others. In addition, inspection equipment is bifurcated into AOI, AXI, and SPI. Based on end use industry, the surface mount technology equipment market has been segmented into automotive, aerospace and defense, consumer electronics, healthcare, industrial and others. Geographically, the global surface mount technology equipment market has been bifurcated into North America, Europe, Asia Pacific, Middle East and Africa, Latin America. The surface mount technology equipment market has been provided in (USD million) in terms of revenue and (Thousand Units) in terms of volume as well as the CAGR for the forecast period of 2018 to 2026. 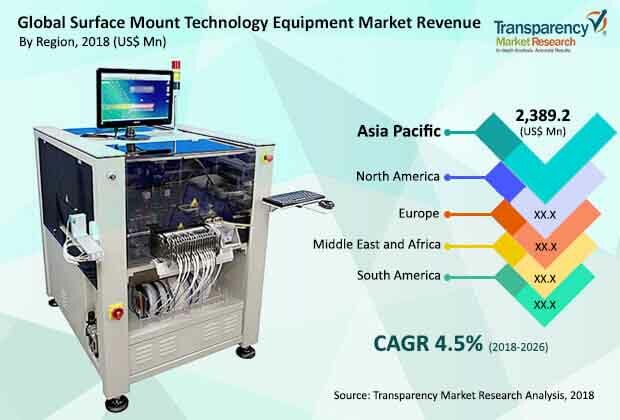 The report also highlights the competitive landscape of the surface mount technology equipment market, thereby positioning all the major players according to their geographic presence and recent key developments. The comprehensive surface mount technology equipment market estimates are the result of our in-depth secondary research, primary interviews, and in-house expert panel reviews. These market estimates have been analyzed by taking into account the impact of different political, social, economic, technological, and legal factors along with the current market dynamics affecting the surface mount technology equipment market’s growth. The global surface mount technology equipment market is characterized by the presence of numerous key players in the market. The key market players focusing on factors such as price, performance, quality, support services and innovations of product to compete in the market. Major players in surface mount technology equipment market are Mycronic AB, Nordson Corporation, Viscom AG, Fuji Machine Mfg. Co., Ltd., ASML Holding, N.V., KLA-Tencor Corporation, Juki Corporation, Panasonic Corporation, Hitachi, Ltd., Orbotech Ltd, JUTZE Intelligence Technology Co., Ltd., Koh Young Technology, Mirtech, Omron Corporation, PARMI Corp., Test Research, Inc., and Yamaha Motor Co., Ltd. among others.